The Healthcare Alliance for the Homeless collaborated with four groups to organize a Justice for the Homeless Month, designed to help Tufts medical students further understand the social determinants of homelessness and the role health care plays in the lives of homeless people. Tufts for Social Justice in Healthcare presented a panel with faculty from Tufts’ Departments of Sociology and Urban and Environmental Policy and Planning, focusing on poverty and housing security. The Phoenix Project screened Fixing the System (2015) with an introduction from Dr. Rebecca Berman, who spoke about the connection between homelessness and incarceration. The Addiction Medicine Interest Group hosted Addiction Medicine expert Dr. Sarah Wakeman from MGH, who underlined the impact mental health and addiction have in the homeless population. The Biomedical Queer Alliance invited both Mandy Lussier, director of Youth on Fire, and members from YOF to describe the mission of YOF and unearth some of the unique hurdles that LGBTQ youth face in terms of discrimination, stigma, and rejection. Healthcare Alliance for the Homeless hosted a luncheon with Dr. Munson and three Consumer Advisory Board (CAB) members from Boston Healthcare for the Homeless Program (BHCHP). The main aim of this initiative was to bring individuals together who identify as multiracial and or identify with the multiracial experience. Students in college often do not know multiracial adults. Also, multiracial individuals often are isolated within monoracial groups which may include their families. This programming sought to build connections across ages and between communities on and off campus. To do so, A Mixed Experienced hosted a community dinner followed by a short film display afterwards. The film was created by a Tufts student and it portrays four multiracial students' identity journals. Some attendees were part of the multiracial club on campus whereas otherswere a part of the Asian American Research Workshop. The Xi Tau Chapter of Delta Sigma Theta Sorority, Inc. & Tufts' Pan-Afrikan Alliance were proud to host BLACK FRIDAY: A Panel & Pop-Up Shop on October 6th from 4:30-9pm. From 4:30-5:30pm in Braker Hall 001 was the Black Entrepreneurship Panel featuring a diverse selection of Black entrepreneurs from various sectors. From 5:30-9pm in the Interfaith Center was the Pop-Up Shop, featuring Black-owned businesses selling everything from Haitian cuisine to headwraps to coffee to clothes! Meanwhile, some of Tufts' best Black performance groups hit the stage during the Africana Festival. COCOA, BlackOut, and ENVY performed! This event was also in collaboration with Tufts' Africana Center, ULink, and the Sankofa Black Business Collective. On November 3, 2017, the Fletcher Religion, Law, and Diplomacy Conference introduced a framework that allows for productive engagement with religion in international affairs. With notable keynote speakers and interdisciplinary panelists discussing what religious literacy means for conflict resolution, business, security, diplomacy and humanitarian action, the purpose of our conference was to develop an appreciation of the importance of religious literacy to international affairs. This student run conference introduced graduate students and the greater Fletcher community to the relevance of religious literacy to their professional spheres. The secondary goal was to create a platform for interdisciplinary dialogue between passionate students, religious peacebuilders, pragmatic security professionals, culturally aware business leaders, and cutting edge academics to engage with case studies that explore the necessity of religious literacy in their field. The Syrian American Medical Society (SAMS) is an organization that provides for the healthcare needs of Syrians both within Syria and in neighboring country’s refugee camps. Each year, they provide for more than three million beneficiaries ensuring that the survivors of the Syrian Civil War are provided the treatments that they need to overcome both physical and psychological hardship. As a student representative of SAMS at Tufts, Julian sought funding to address costs incurred by shipping life-saving equipment, including an ultrasound, four electrocardiograms, and numerous boxes of syringes, speculums, and medical gloves to our organizational warehouse to then be flown directly to the Middle East. The Tufts Food Rescue Collaborative (TFRC) student coordinator and founding member, Lucy Zwigard, attended the New Entry Sustainable Farming Project's Community Food Systems Conference in Boston on December 6/7th 2017, to represent the TFRC and her peers passionate about community food systems issues, food and social justice. The TFRC is a group founded by Tufts students, Tufts Dining, their partner organization Food for Free (a food recovery non-profit based in Cambridge), Tufts Institute of the Environment and the Tisch College for Civic Life. It is a unique program that brings together diverse groups on Tufts campus for the collective missions of sustainability, civic engagement and community service. Lucy and co-coordinator Josie Watson then organized an educational workshop event, “The Ethics of Eating”, to engage Tufts students and the greater community on the ethical challenges of navigating the U.S. food system, which took place October 24. The Community Building Program (CBP) works with the only organization in New England that provides legal, housing, and healthcare services to pan-Asian survivors of domestic and intimate partner abuse, Asian Task Force Against Domestic Violence (ATASK). Most of ATASK’s clients are immigrants and refugees, and have incomes below the federal poverty rate. The CBP works with ATASK’s emergency shelter in the Greater Boston area, which residents use as transitional housing. CBP events brought these residents together for reflective and honest dialogue, as well as relaxing and celebratory events. Through workshops centered around health and wellbeing, as well as celebration events such as birthday parties, festivals, and field trips, the CBP aimed to foster a strong sense of community and strengthen relationships at the shelter. Some of the activities included laugh yoga, cooking and discussing about healthy foods, gardening, and discussions of traditional and alternative healing. CBP’s goal is to provide a social fabric to further support the wellbeing of residents at ATASK’s emergency shelter. Timmy Global Health Service Medical trip is a trip organized by Tufts Timmy Global Health which took place during the Winter Break of 2018. Medical professionals and student volunteers are a crucial part of the trip, conducting 5 days of clinic in different communities. Tufts Timmy Global Health visited these sites during every medical service trip in Xela. Volunteers supported medical professionals in various roles throughout clinic—assisting with vital signs and patient histories in triage; shadowing and scribing for providers' inpatient consultation; helping dispense medications in the pharmacy; administering fluoride to children and adolescents; and other miscellaneous clinic duties (translating, crowd control, data entry, etc.). Spearheaded by the Tufts Buddhist Mindfulness Sangha, “Disaster Relief and Compassionate Action” was a community event geared towards processing and healing from the disasters that have affected California, Puerto Rico, Houston, Miami, Mexico, and so many other places since the start of the school year. Individuals across the university came together for food and solace, beginning with a session of meditation and then opening into a larger dialogue with speakers from groups on campus and local organizations who spoke about collective healing. Examples include the Venerable Priya Sraman (Tufts Buddhist Chaplain) and Jumbo Hurricane Relief, music from Public Harmony, and guests from Tzu Chi. The event concluded with an empathetic mural where participants had the chance to express their feelings and prayers about these tragedies. The 2017 Conference on Gender and International Affairs, Money, Power, and Influence: The Gendered Dimensions of Geopolitics engaged the Tufts community in conversations on gender and power and their impact at the individual, community, institutional, state, and multilateral levels. Through these conversations, the conference aimed to deepen participants’ understandings of the relevance of gender in relation to status, access, and influence in all areas of international relations. The Conference sought to reiterate the importance of applying an intersectional lens towards international issue at every level, as gender and power intersect with other aspects of identity, such as class, citizenship, and sexuality. Panels were supplemented with specialized breakout sessions, art exhibits, and an employer showcase. Ultimately, the goal was for audience members to leave the conference with a broader, more nuanced understanding of intersectional gender analysis and as advocates for gender- sensitivity within their fields of work. As a part of the Indigenous Speaker Series, students celebrated indigenous art and activism with Monte Yellow Bird Sr., better known in the art realm as Black Pinto Horse. Monte Yellow Bird Sr. is an award winning Native American ledger artist and painter, educator, storyteller and motivational speaker devoted to sharing Native American culture and tradition to build harmony between humanity and nature. Monte uses his art to inspire peaceful and productive dialogue as an element of his alternative method to conflict resolution through his unique experiences as a Native American leader. Monte’s work is part of a broader theme of Indigenous activism through art and storytelling aimed at sharing indigenous narratives, heritage and culture. The Tufts Energy Conference, now in its 13th year, is an annual event that brings together professionals, students, and experts from the private, public, and nonprofit sectors to discuss critical global energy issues. This year, they sought to spur thought, conversation, and creative action around Transforming Outlooks Into Realities. They explored what policy, technology, and financial disruptions must occur to transform the global energy paradigm to meet national and international goals in 2030, 2050, and beyond. The two-day conference took place on February 2nd and 3rd. Students brought in energy and environmental experts from the national and international spheres. They offered a keynote speaker on both Friday and Saturday, an energy and environmental employer showcase, a student energy innovation competition, a networking social hour, and a chance for undergraduate and graduate students to learn, network, and explore exciting energy possibilities. Communities in which a large proportion of the residents are of minority and/or immigrant backgrounds commonly experience health disparities and inequalities. These populations have a particularly hard time getting proper health and oral care due to lack of knowledge, cultural differences, poor communication, insurance problems, and so on. As a result, they tend to receive lower quality care and poorer outcomes. In order to address this in Chinatown, TUSDM’s Asian Dental Organization (ADO) worked to establish a long-term relationship with the Greater Boston Chinese Golden Age Center. This center is a nonprofit organization that is geared towards aiding the Asian elderly, Cantonese-speaking population. ADO provided oral health services and education for the elderly in the form of educational presentations, group activities, and oral cancer screenings at Golden Age’s three sites. Out of Order is a groundbreaking documentary that explores the experiences of LGBTQ+ people discerning the call to ministry while they confront a history of bigotry and work to build loving support within their churches. This film follows six queer individuals of faith on their personal journeys of gender transition and lived sexual identity in the Presbyterian church. The event began with a screening of this film, followed by a dinner and discussion with Alex McNeill, a transgender man of faith whose story is chronicled in the documentary. Students also partnered with the local Presbyterian congregation, Clarendon Hill, to extend the conversation of LGBTQ+ identities in faith beyond the boundaries of Tufts. A small group of students and faculty have come together to form a group that they call Jumbo Hurricane Relief in an effort to raise money for some of the Caribbean islands that were devastated by Hurricanes Irma and Maria in September 2017. It aimed to raise at least $15,000 over the course of this academic year, which they will be distributing to organizations engaged in relief efforts in the islands of Puerto Rico, Dominica and Barbuda. The group raised money by tabling at events of other student clubs on campus at which they either bsold foodstuff or gave out items of paraphilia in return for donations, which in themselves will raise awareness about the effects of these hurricanes. They also hosted an educational event and a small benefit concert in the Spring of 2018. Jumbo Hurricane Relief aimed to raise awareness among the Tufts student body of the long-lasting effects of such hurricanes, the status of recovery and rebuilding, and our role as global citizens contributing to this effort. Skin Wellness for Women Experiencing Homelessness was an innovative public service project proposed by two Tufts medical students, Diana Bartenstein and Haya Raef. By combining educational workshops about skin, hair, and nail health with dermatologic services such as moisturizing hand/arm wraps, rejuvenating facial aesthetic treatments, and cleansing foot soaks, the project aimed to prevent dermatologic conditions that women experiencing homelessness commonly suffer from. In addition to skin wellness, the project sought to encourage stress-reduction, relaxation, improved self-esteem, and empowerment among women. Skin Wellness for Women Experiencing Homelessness sessions occured monthly at Health Empowerment & Resources (HER), Boston Health Care for the Homeless Project's weekly drop-in space for women. Project leaders additionally received support from the Schweitzer Fellowship, Massachusetts General Hospital Department of Dermatology, and Tufts Medical Center Department of Dermatology. In response to the heat up of events in Catalonia, a Fletcher exchange student from Spain organized a multi-disciplinary panel on Catalonia entitled, “Catalonia at a Crossroads." The discussion was structured around four topics: 1) political-historical underpinnings, 2) legal framework and lack of international recognition, 3) economic outcome and 4) international media coverage. The project was part of the long term project of establishing a permanent Human Rights Center in Rwanda that will train human rights defenders across the country among all the 416 sectors of Rwanda. The long-term goal is to have trained human rights defenders share their knowledge with peers in their respective sectors and assist in identifying and reporting any human rights violations happening in their communities to the appopriate channels. Two Tufts students from Rwanda collaborated with the law schools to hold a one-day training on the fundamental principles of human rights with students from four law schools and hosted a debate on free speech in contemporary Rwanda. The goal of the training and debate was to open up the eyes of Rwandan youth and boost their interests in human rights, a topic that seems to be left out of the narrative among that population. Jumbo Aces was a program designed to provide free tennis clinics to students in the Somerville and Medford area. Tennis is an inherently expensive sport with costs going towards rackets, balls, string, and coaching, and students from various Tufts tennis teams wanted to make sure that every child had the opportunity to play the sport. As a collaboration between the Tufts Varsity and Club Tennis teams, their goal was to eliminate financial barriers that prevent children from playing the sport that has enriched their lives. Team members serve as coaches, mentors, and most importantly, friends to children within the public school system interested in pursuing this sport. This two-day symposium, occurring on February 1st and 2nd, 2018, was organized by the Tufts University Prison Initiative at Tisch College (TUPIT). It aimed to engage undergraduates, graduates, and faculty members from several Tufts campuses, along with community members and peers from other universities interested in mass incarceration, in thinking critically about diversity and social-institutional change on our own campuses while simultaneously underscoring the value of social justice work beyond Tufts, specifically at the prison complex in Shirley, MA where Tufts is now running classes. The symposium’s speakers included formerly incarcerated individuals who have experience with higher education programs in prison and/or who survived solitary confinement, as well as criminal justice reform advocates. Students around the university organized a major event during Black History Month and staged an important one-man play about Thurgood Marshall. Their goal was to engage diverse communities at Tufts on topics related to race in America and Civics, through a shared theater experience that brought both topics to life. “THURGOOD” is a one-man show about the first Black Justice of the Supreme Court, Justice Thurgood Marshall. In this powerful play, Justice Marshall tells how he became the first Black man to serve on the Supreme Court. By creating an event that brings to life the importance of Thurgood Marshall, as both a civic leader and civil rights legend, they supported the ongoing campus-wide goal of bringing important discussions about Blackness, race, and civic identity to the forefront of our conversation. The play was immediately followed by dinner and small group dialogues (run by Tisch College Dialogue Fellows) to process the many messages of the show. This one-time, highly acclaimed performance was available at no cost for the campus community. The Tufts Muslim Student Association, in conjunction with the Black Student Union, the University Chaplaincy, and the Africana Center, presented “Exploring the Black Muslim Identity” on Saturday February 24th, 2018 from 6-8PM in the Sophia Gordon Multipurpose Room. This event focused on the intersectionality of the two severely underserved, underrepresented, and oppressed group in America, Black Muslims. The event included performances by Tufts students as well as a panel featuring Dr. Fatimah Fanusie, Zaheer Ali, and Dr. Sylvia Chan-Malik, all of whom discussed the history of Black Muslims in the Boston area as well as the trials and tribulations faced by Black Muslims in America. “Super Arts Saturday” was an event that brought together students and faculty across academic departments with the goal of providing a space for community children to find joy in the arts and express creativity. This project invited community children to Tufts' top arts facilities to attend a variety of workshops taught by Music, Art, Drama and Dance Department students and faculty. 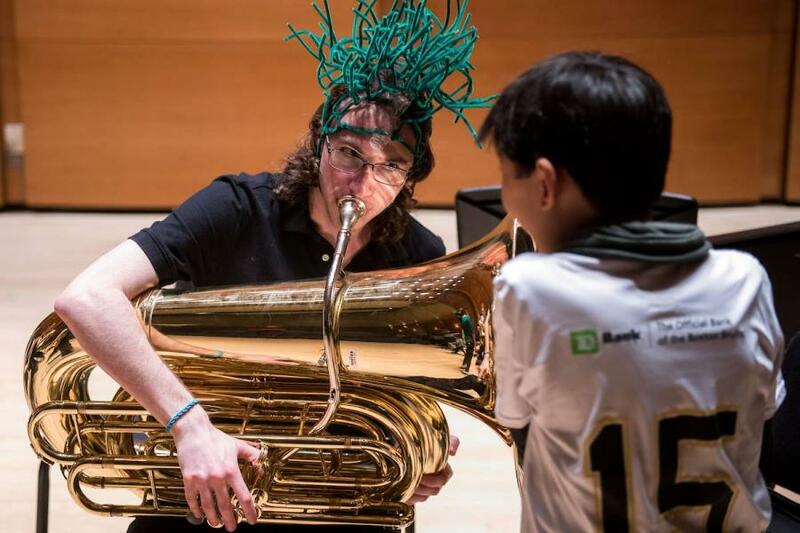 The idea for this event was developed by Edith Auner, founder and coordinator of the Tufts Community Music Program, as an extension of the program’s regular Saturday afternoon activities for children. The “Super Arts Saturday” event was held in the arts complex on Saturday February 24th from 1:00pm to 5:00pm and began with a performance by the Tufts Wind Ensemble at 1:00pm. Following the concert, they offered a selection of 25-minute workshops every half hour, four times, followed by a reception in Granoff at 4:00pm. Children and their families had the option to choose from such workshops as: an instrument petting zoo,conducting station, African drumming and dance, composition, fine art projects, acting workshop, and dance workshop. By making music and the other arts fun and accessible within the “Arts Super Saturday,” the arts community at Tufts hoped that community children will feel empowered to keep music in their lives - for the sake of cultural enrichment, self expression, and mental and emotional development. In 2010, a group of students created the Tufts Idea Exchange, or TEX. The Tufts Idea Exchange brought together students, faculty, and alumni and provided a platform to share their ideas with the community. TEX became the precursor to TEDx Tufts, showcasing the creative and innovative potential of the university. After five increasingly successful years hosting events, the TED corporation granted Tufts a license to host the club’s first TEDx event, and so TEX became TEDx Tufts. Since its inception, this organization has given speakers the opportunity to present on a vast number of topics -from living on Mars to how different vocalizations affect our perception of others. TEDx Tufts provides students and faculty the opportunity to showcase a plethora of topics that are being researched, taught, and discovered at this school. By bringing people from all backgrounds onto one stage, TEDx Tufts provides the community with an invaluable experience, breaking down borders and nurturing a community of individuals who want to connect, create, and foster growth. The 3rd Annual Fletcher Latin America Group (FLAG) Trek to Mexico City provided 20 Fletcher School students with the opportunity to gain a better, more holistic understanding of the U.S.-Mexico bilateral relationship. Amid the ongoing NAFTA renegotiation, constant calls for a border wall by the U.S., and joint efforts to address issues of hemispheric concern like energy and the political and humanitarian crisis in Venezuela, the U.S.-Mexico relationship has been greatly tested. This trek complemented participants' work in the classroom by engaging with U.S. and Mexican government officials, as well as leaders in the Mexican non-profit and business sectors. Students hoped to return with a better understanding of the current relationship, and committed to elevating the public discourse on this subject within their respective communities. Medford Conversations is a volunteer organization that arranges small discussion circles guided by trained facilitators. They also coordinate larger reflective gatherings that complement these discussions. They believe that building a stronger Medford starts with open conversations about the issues impacting our communities. Their mission is to include and actively engage a multiplicity of voices in the Medford community. In Spring 2018 Medford Conversations hosted the series, “At What Cost? The Price of Living in Medford.” ​Through their Opening Event, conversation circles, and Closing Event, they discussed housing, transportation, and access to other basic needs in Medford. Through conversations, Medford Conversations hopes to encourage people to create and act on visions for a sustainable, just, and thriving Medford. Light refreshments and childcare were provided at the opening and closing events. In April 2018, a team of students from the Tufts University School of Dental Medicine traveled to Jinotega, Nicaragua to provide free dental care to patients living in the community of Los Robles. The team was under the supervision of faculty advisor Dr. David Paul and worked closely with Comunidad Connect, a local non-profit organization that operates the community health clinic serving as the team's worksite. For the duration of spring break, the students treated hundreds of patients alongside Dr. Paul and Dr. Lanzas (Comunidad Connect's resident dentist), participated in educational outreach for oral health promotion, interacted with and immersed themselves in the local community, and gained firsthand experience in global service learning. The trip promised to be a testament of teamwork, open-mindedness, and, most importantly, giving back to those in underserved communities. In the wake of the severe devastation inflicted upon Southeast Texas by Hurricane Harvey, one may wonder how the victims of such a horrible natural disaster can reclaim their lives with so much of their homes and neighborhoods destroyed by an unforgiving storm. Where is the justice in such an unjust situation, and why is this an important question to answer? In partnership with local community organizations and NGOs, ServeUp 18 seeks to take the first step in giving hope back to storm victims by providing on-the-ground disaster relief. From March 17 – 24, ServeUp 18 sent a group of motivated and compassionate Tufts students to Southeast Texas to clean and rebuild homes of those impacted by Hurricane Harvey. In doing so, students had the opportunity to not only develop a heart for community service and active citizenship but also to explore the larger question of how faith, justice and service can be integrated into one’s life to build towards a more equitable and just world. ServeUp invites Tufts students of all backgrounds and beliefs to come together and spend their spring break in service and learning. The In Good Faith Reading Initiative is an interfaith program that brought together undergraduate Tufts students with students from an Indonesian university to meet over the course of seven weeks and discuss interfaith learning and growth. The students came together by virtual exchange to discuss various readings and their personal experiences with Judaism and Islam. This program was particularly exciting this year because In Good Faith recently acquired the rights to translate Elie Wiesel’s novel Night into Indonesian for the the first time ever, to help promote accessibility and dialogue in regards to building pluralistic societies. This organization was founded by Jewish Fulbrighters in Indonesia, and has designed this reading initiative for the sake of expanding interfaith dialogue at Tufts to include many diverse voices, in and outside of the immediate Tufts community. Two Tufts University sophomores started a podcast titled "Beyond Glass Walls." The theme of this podcast centers around gathering various Tufts students to have free-from discussions regarding various societal and political issues in attempt to remove the socially conditioned “walls” that we’ve constructed between each other through civic dialogue with diverse individuals. Each episode is styled as a conversation between ourselves and 2-3 participants and lasts around an hour. Some of the topics we've covered include race relations, family dynamics, sports culture, gun reform, dreams, and women's health and sexual expression. Although the topics we address are complex in nature, comedy and humor serve as vital tools for us to engage in these nuanced discussions as well. The 2nd Annual Fletcher Food Symposium: Food and Conflict supported conversations that connect why and how food can be drivers of conflict as well as be central to survival and resilience within zones of conflict. As a collaborative effort between the Fletcher Culinary Diplomacy Club, Fletcher Food Policy Group, the Fares Center for Eastern Mediterranean studies, and Tuft's Culinary Society, this event aimed to build a common understanding of the politics of food through the lens of security, human security, conflict resolution, and peacebuilding. Oshakati town in Oshana region, Namibia is a densely populated a town with most people living in makeshift houses. According to a 2016 HIV sentinel surveillance, a survey conducted among women of child-bearing age, Oshakati had an HIV positivity rate of 17.3%. The positivity the rate among 15-24 year old is 9%.The Oshakati Health District introduced Teen Clubs in 2017 with the aim of promoting adherence to antiretroviral treatment (ART) among teens and to assist parents/guardians in disclosing the HIV status of children on care. Teens meet at the facility to engage in various group psycho-social activities including skill building.Johannes Kahwadi, a Tufts University MPH student and Fogarty Fellow, came up with an initiative to collect books through donations. The mission of the initiative is to start a library to cultivate a reading culture and improve their English skills, which will eventually improve school performance and keep them engaged in social activities. Johannes then requested for donations by posting on a Facebook page for Medford residents; Free things in Medford, for the donations. In response, he collected more than 160 free novels donated by individuals, Medford public library, and from drop-off points. Johannes sought financial assistance to cover the cost of shipping the books to Namibia.